Today the Foreign Secretary announced to Parliament a new strategic shift for the FCO’s overseas network that will extend the FCO’s global reach and strengthen its influence with the 21st century’s rising powers. “Our Embassies and High Commissions are the essential infrastructure of our country’s influence overseas and of our economic recovery. They provide an early warning system for threats to our security and to wider peace, and assist British nationals in times of crisis. They support our economy and help British businesses access markets abroad. They promote our values of democracy and political freedom across the world and help craft vital international agreements from nuclear proliferation to climate change. We could do not do without them for a single day. I promised in our first week in office in the coalition government that there would be no strategic shrinkage of Britain’s diplomatic influence overseas under this government, and that instead we would strengthen Britain’s diplomatic network. Today I want to set out how we will achieve this while saving money overall. 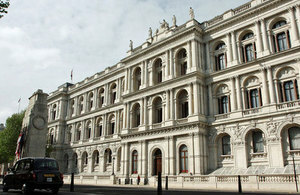 The Spending Review settlement for the Foreign Office requires a 10% real reduction in the budget. This is of course on top of years of unplanned cuts after the last Government stripped the FCO budget - over half of which is spent in foreign currencies - of its protection against exchange rate fluctuations in 2007 just before the sharp fall in Sterling. In the last two years before the General Election, the Foreign Office experienced a 14% real terms reduction in its budget resulting in the sudden loss of personnel and training in many Embassies. The Foreign Affairs Select Committee of this house has done much to sound a warning about these matters, and I have been unable to find any other major Foreign Ministry in the world that raises and reduces its diplomatic activity on the basis of movements in exchange rates. I promised to put an end to this ludicrous situation and this protection is now being restored under a new foreign currency mechanism agreed with the Treasury. This means that the Foreign Office can once again plan properly for the future. We will save over £30 million by simplifying procedures, removing bureaucracy and ensuring that administrative work done overseas is by locally recruited staff or in regional centres. We will save over £34 million a year from our annual estates and security costs, for instance by moving to a single site in London. And we will reduce our annual staff costs by £30 million a year by 2014 by reducing to a minimum the number of junior staff posted overseas from London, by removing or reorganising their positions or recruiting locally, in consultation with staff in order to mitigate the impact on individuals and their careers. These savings are not easy but they are essential. They will allow us to live within the necessary financial constraints and to provide the diplomatic network we need for the future. We will now reverse the previous Government’s policy of closing Embassies and reducing our diplomatic presence in key parts of the world, as a result of which 45 United Kingdom posts were closed after 1997, including 6 in Africa, 7 in Latin America and 8 in Asia, and the overall number of UK posts in the world fell by more than 30. We will embark on a substantial reinvigoration of the diplomatic network to make it ready for the 21st century; to expand our connections with the emerging powers of the world, and to signal that where Britain was retreating it is now advancing. The case for a strengthened network is utterly compelling. The only way to increase our national prosperity and secure our growth for our economy is through trade, and our Embassies play a vital role in supporting British business. The emerging powers are themselves expanding their diplomatic network, with Turkey opening many new posts and Brazil already having more posts in more countries in Africa than Britain has. Given that political influence will follow economic trends in the world and will increasingly shift to the countries of the South and the East over the long term, we need to plan ahead and create the right network for the future. While we are working closely with the new European External Action Service and ensuring that talented British candidates enter it, there is not and will never be any substitute for a strong British Diplomatic Service that advances the interests of the United Kingdom. We can never rely on anyone else to do that. So we will significantly increase our presence in India and China, the world’s two emerging superpowers. We will strengthen our frontline staff in China by up to 50 officials and in India by 30, working to transform Britain’s relationship in their fastest growing cities and regions. We will also make a substantial expansion of our diplomatic strength in Brazil, Turkey, Mexico and Indonesia. We will add diplomatic staff in all of the following countries or places: Thailand, Burma, South Korea, North Korea, Taiwan, Mongolia, Malaysia, Nigeria, Angola, Botswana, Chile, Argentina, Colombia, Panama, Peru, Pakistan, Vietnam, and the Philippines. We will maintain the strength of our delegations to multilateral institutions such as the United Nations in New York and Geneva and at NATO and the European Union in Brussels, all of whom have done an outstanding job in recent months. And we will maintain our active and substantial Embassy in Washington and our network of Consulates General across the United States, which remains our indispensable ally in defence, security, foreign policy and commerce. We have a strong network in the Middle East and North Africa on which the demands have been so great in recent months. While there is no need to open new posts there, we have frequently and substantially reinforced our diplomats there in recent months, sent a special mission to Benghazi, and we will review over the coming months the need for additional deployments. This expansion does come at a price. In Europe there have already been significant savings in our diplomatic network. I am determined not to hollow out our Embassies there. But we will need to find further savings in recognition of the fact that only three of the world’s 30 richest cities are in Europe in terms of total GDP, and our Embassies there still cost more than elsewhere. So while we will fully maintain our Embassy network across Europe we will also find additional resource for our expansion elsewhere in the world from the network of subordinate posts in Europe outside capital cities. We will withdraw diplomatic staff from some subordinate posts while retaining UKTI and consular staff in many cases. This will lead to fewer subordinate posts in European countries. We will re-open the Embassy in El Salvador closed in 2003, as part of a major diplomatic advance in Latin America after years of retreat. We will open a new Consulate General in Brazil at Recife, which will be one of approximately 7 new Consulates General which we will open in the emerging powers. We will open a new Embassy in strategically-important Kyrgyzstan, and another in July in the new nation of South Sudan. I always doubted the last Government’s decision to close the Embassy in Madagascar, which I know many members of this House on all sides objected to, and I am delighted to say that we will re-open this Embassy as soon as the local political situation is right. I will also consider upgrading our political office in Cote d’Ivoire to a full Embassy. I have also made provision within our budget to open a new Embassy in Somalia when the security situation has improved sufficiently. It is vital for our security that we are present in the Horn of Africa and so I have made the decision now so that we will be ready to do this as soon as is possible. In addition to these new Embassies I give a commitment to the House today that whereas the previous government shut 17 sovereign posts in its time in office, we intend to retain all existing 140 British Embassies and High Commissions throughout the life of this parliament. Other savings will also be found as we reduce over time our diplomatic footprint in Iraq and Afghanistan, which is very large relative to the rest of the network. As the nature of the UK military involvement changes in Afghanistan we will redeploy staff elsewhere. The strength of our Embassies is a signal to the world of our engagement and of our role in international peace and security. They are the platform for the strong bilateral relations that are increasingly vital in a networked world and indispensable to success in multilateral diplomacy. Our decisions mean that our reach when British companies need assistance or British nationals are in danger will go further and will be stronger. That is why the maintenance, extension and strengthening of our global diplomatic network is a central objective of this government and will be a priority for the use of FCO funds over the coming years. Although I have increased programme funding in the FCO to £139 million this year, our financial constraints and the priority I am placing on retaining and improving our diplomatic network for the future means that this programme spending will have to fall in future years, although it will remain above £100 million. I am sure it is right to give priority to long term relations and the reversal of Britain’s strategic shrinkage. This development of our network should be seen alongside the Diplomatic Excellence initiative which I have instigated in the FCO and which began six months ago. This places a renewed emphasis on policy creativity, on in depth knowledge of other nations, on geographic and linguistic expertise and the enhancement of traditional diplomatic skills in a manner suitable for the modern world. A combination of strict savings in administrative spending, reductions in our subordinate posts in Europe and the other savings I have set out will allow us for the first time in many years to mount a diplomatic advance. For the first time in decades our diplomatic reach will be extended not reduced. It is the right use of public money and it is the right course for Britain in this century.